Design and made in Germany Invc-Mak Series 10 kW Inverter. The three-phase current taken from the AC source is converter to a regulated DC voltage by a DSP controlled rectifier. Protect procedure of the power components , the rectifier bridge is fused with a fast acting fuse. The DC current taken from the rectifier is converted to a sinusoidal and regulated AC voltage by an IGBTs inverter (Insulated Gate Bipolar Transistor), using PWM (Pulse Width Modulation). This means that the digital signal processor controls the IGBTs. The DC input voltage is divided into pulsed voltage to generate a low distortion sinewave AC output voltage good transient response for the voltage regulation. A transformer is provided at the output of the inverter bridge. 10 kW inverter are designed according to European stadards. We use high quality components and spare parts for the production of 10 kW inverter. The INVC-MAK series that made in Germany range to technical specifications for industrial applications. Energy’s long-time relationship with industrial businesses. Electronic power control (EPC), Energy services included: Consultancy services Pre-engineering design and support Project Management (contract management, detailed engineering, documents for approval, manufacturing, product testing, witness-testing if requested, shipment, tailored user manual) Services (recommended commissioning spare parts, commissioning services, product long time spare parts, hotline, trainings. As Mak Plus Power Systems Germany, we produce high quality 10 kW inverter solutions which is convenient with your requirements. Because, it is really important to choose correct inverter solutions. The system operates on a microprocessor based thyristors charger and microprocessor- based Insulated Gate Bipolar Transistor (IGBT)s inverter. The digital vector control technology is developed for the performance of the 10 kW Inverters. By adding system components, such as paralleling kits, safety and disconnecting devices, distribution cubicles, as well as software and communications solutions, it is possible to set up elaborated systems ensuring complete AC load protection. 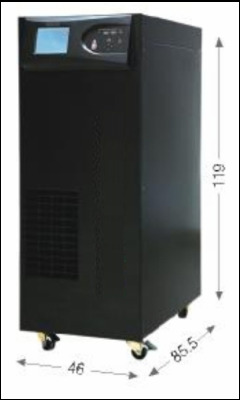 The 10 kW Inverter that made in Germany, provides high quality AC power for electronic equipment loads. The 10 kW Inverter uses today’s most reliable topology: the double conversion. It converts AC power from an AC source in to DC power to charge a battery and reconverts it into AC power to provide a clean and reliable AC output to power the AC load. The critical AC load is continuously supplied by the inverter. The rectifier charger derives power from the AC source and converts it into DC power for the inverter whilst simultaneously maintaining the battery in a fully charged and optimum operational condition (floating mode). The inverter converts the DC power into clean and regulated AC power to supply the critical load through the static transfer switch. The power loading can reach up to 100% of the inverter nominal rating without considering the 10 kW inverter in overload conditions. While supplying the load, the inverter and static switch control unit monitors the reserve supply signal and ensures that the inverter bridge tracks the reserve supply frequency. Thus, any automatic transfer to the reserve supply (e.g. when an overload is detected) is frequency syncronised and does not cause an interruption to the load.